Just when you thought that Fluxx had gone as far as it could go - it blasts off for the Stars! Explore the vastness of space-themed humor with your valiant Captain, Engineer, and, of course, your Expendable Crewman. Go check out that Small Moon - or is it really a Space Station? You may be swayed by Unseen Forces, held hostage by Evil Computers, or find your ship infested with Cute Fuzzy Aliens. Beware the unexpected as Star Fluxx takes you straight into a Wormhole of hilarity. You'll find yourself wanting to play again and again - watch out... It's A Trap! For those of you who don’t know what Calvinball is, it is a game Calvin – from the comic strip ‘Calvin and Hobbes’ – made up. And if you don’t know Calvin and Hobbes, you should definitely check it out! There is only one rule to Calvinball, and the one rule is that it cannot be played the same way twice. I haven’t played other Fluxx games, but I know that the basis of the game remains the same and the themes change. 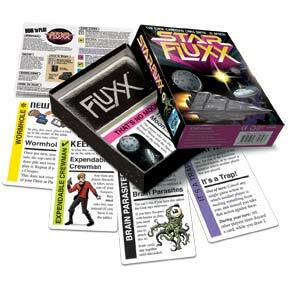 Star Fluxx is a card based game where the players change the rules and objectives required to win. Every game starts out the same – draw one card and play one card. But with cards changing rules and objectives, the game takes different twists and turns. The deck of cards contains rule cards, which change rules, goal cards, which tell you what needs to happen in order for someone to win, action cards, which let you do something, keeper/creeper cards, which you need in order to complete the/a goal, and surprise cards, which can ruin an opponent’s (or your own) plan. To win the game, you need to have the appropriate keepers (or creepers) in your possession that match the current goal card. You may already be visualizing how crazy this game can become. Never have I played a game where you can be so close to winning, and in a split second, you’re not even close. A positive about this is that everyone playing has a chance to win, and everyone also has a chance to foil someone else’s plans! On top of that, add a sci-fi theme to it, and you’re going to get a lot of nerdy jokes mashing up all sorts of well known sci-fi tales, including Star Wars and Star Trek. The more you know sci-fi, the more enjoyable this game will be. And if you aren’t a sci-fi buff, that’s ok because this game plays well and will make sense to you even if you don’t get some of the references (but if you’ve seen Star Wars, you’ll get a lot of the references). While I enjoy this game, it is certainly not a ‘go-to’ game for me. It’s easy to teach and learn, but the unpredictability of the game can be frustrating to new players. And the unpredictability leads to erratic game lengths. The game can last 10 minutes, or 45 minutes, depending on what cards are played. On the positive side, the unpredictability increases its replay value. Component-wise, the cards are ok. The artwork is fun and the cards do a good job of explaining how they work, but the card quality itself is just ok. If you play it a lot, they’ll get dog eared pretty easily. The instruction manual is marginally helpful. If you haven’t played the game before, the manual won’t make much sense. But the instructions DO say that the best way to learn it is to play it, and I totally agree with that. The cards tell you how to play. This is the first fluxx game I ever played and I immediately loved it. Basically, fluxx is a card game where the rules can change throughout the game. The goal of the game is to match what is on the goal card, but be weary, the goal card is constantly changing… players place “keeper” cards which are used to fulfill goal cards and declare victory. But watch out, “Creeper” cards can infect your play area and prevent you from winning. Players can play new rules which can drastically change the game or can play action cards or surprise cards to effect the game play as well. basically, the game starts with a draw 1 and play 1 rule but can quickly change as there are “new rules” cards which vary from specific rules to increasing draw and play amounts, and there is even a play all rule which forces players to play every card they have (this usually leads to a faster game depending on the draw rule). Overall, this game can get a little crazy but is easy to learn. It isnt a very long game and is great for short to medium game sessions. It can be a good intro to tabletop gaming, especially for people who are into sci-fi but are hesitant to play. there are a bunch of different themed fluxx’s as well as the original fluxx which are also very fun. In terms of replay value, this game has a lot of replay value, but victory is almost always a surprise so dont expect this game to be super competitive or fulfilling. It is more just fun and a good way to pass time. Great for family and casual gamers. Star Fluxx is the Fluxx family of games that adds a lot of sci-fi tropes from just about every sci-fi show that many of us all know and love. It plays very similar to other Fluxx titles and adds “creepers” to the game to mix things up. Fluxx is pretty simple game in that you start out with a few rules, then the cards continue to change the rules as you go. That’s really what the game is about … the rules are “flux” throughout the game. Players start out with a hand of cards and can only draw one and play one card on their turn unless they play something that changes the rules. There are six types of cards in Star Fluxx: rules, actions, goals, interrupts, keepers, and creepers. Rules – allow a player to change the rules, and normally cover up older rules (e.g. draw two cards a turn instead of one). Actions – allow a player to perform a special action like search the draw pile for card. Interrupts – allow a player to perform and action on someone else’s turn. Goals – these cards set the winning conditions for the game. Creepers – these special cards attach to a one of players keepers cards immediately depending on the creeper type. A player cannot win with a creeper card even if they have certain keeper cards to meet a goal. The only way a player can win with a creeper is if a goal explicit states the winning conditions has that creeper. Multiple creepers will definitely prevent a win. So the goal of the game is to meet the current goal card’s winning conditions. Players can override goal cards with goal cards they play, because normally, only one goal card can be in play. This where the chaos ensues as players jockey to get the goal card they need, and everyone else disrupts the play with different rules and actions. Star Fluxx is meant to not be taken seriously. It’s all about having fun and being along for the ride as the game twists and turns to a conclusion. I really enjoy that game when I need a break from heavy brain burning games. Although, it still has a lot of “take that” factor to it. The only downside besides the randomness is that the game could potentially take a REALLY long time. This doesn’t happen often, because sometimes people are dealt the winning hand on the first turn. Those are rare occasions, but potential buyers should be warned. No one can begin to predict how long a round of Star Fluxx will take. Just be ready to buckle in your straps and prepare for LUDICROUS SPEED! Casual Gamer – YES – rules easy, just a hoot. Power Gamer – NO – not deep enough. A fun little game, the theme of space is an improvement on the original Fluxx which felt a bit to bland. I like to use this game at the start of game-nights with people who don’t tend to play games very often as it’s easy to explain and it’s luck based mechanics meant that anyone could win it. Less enjoyable for those who didn’t get the references but I enjoyed the ‘similar yet legally distinct’ references including “Intergalactic Travel Guide” and the “Disposable Crewman”. However for more seasoned gamers Star Fluxx may feel to basic and become bored by the mainly luck based game. Star Fluxx is my families favorite Fluxx game. The theme is fun and well done. The Creepers attaching to the Keepers is different from the other Fluxx games we’ve played. (Mechanical Keepers can malfunction, anything with an organic brain can get a brain parasite, and everything can be evil!) The actions are interesting and the surprises are good. Overall, it’s fun, funny, and you have a little more power over this game than the average Fluxx game. My family has played it more times than I can count. This is THE game we use to either start or end the night. It is so easy to learn and can change at the drop of a hat (or more likely a card). We use it to limber up before our more serious BSG game and it only takes about 10-20 minutes. You start with 3 cards and then draw a card and play a card – simple enough. BUT, every card you play changes the rules. Could be a subtle change, could be a huge one!! This type of randomness may sound boring to some and the changing rules may sound complex, but just try it, the game is innocuous enough to entice so let it!! Add a Review for "Star Fluxx"